Is there any preventative maintenance that can be done with the tailgate latch? Mine ‘18 seems to be getting a little tough to open and although it’s under warranty I thought if I could lube, grease, silicone, spit on, or whatever it takes to loosen it up it’d be nice. Thank you for your consideration and as a side note I will not be having a garage sale this weekend. Some useful information from GM TechLink regarding the GMC MultiPro Tailgate. Remember, Do not lower the inner gate with the primary gate open while a receiver hitch is present or Trucks Equipped with a Hitch Ball Do not lower the inner gate with the primary gate open (easy access or step positions) if a hitch ball or trailer is attached. This may damage the tailgate due to the amount of clearance between the hitch receiver and the lowered inner gate. (Fig. 26) Fig. 26 Tailgate Operation When the BCM receives a release command to release the primary tailgate or inner (auxiliary) gate, it applies a brief pulse of voltage to the appropriate left and right pickup box latch relay control circuits, which energizes the coil side of the relays. The switch side of the appropriate left and right latch relay then momentarily closes, supplying a brief pulse of battery positive voltage to the left and right pickup box primary tailgate or auxiliary endgate latches. (Fig. 27) The latches activate to release the gate. Fig. 27 The inner auxiliary pickup box endgate must be in the latched position before commanding the primary tailgate to release. The BCM disables the primary tailgate release function if the inner auxiliary pickup box endgate is open or ajar. John Goreham Contributing Writer, GM-Trucks.com 2-6-2019 Ram revealed a new 60-40 swing away split tailgate this week. Ram wasted no time in throwing out a zinger to the GMC folks, saying, "Unlike other multi-element tailgates, the Ram multifunction tailgate is trailer-friendly and does not require that the trailer and hitch be removed before opening." What Ram is apparently referring to is possible interference with the new GMC six-position MultiPro tailgate. 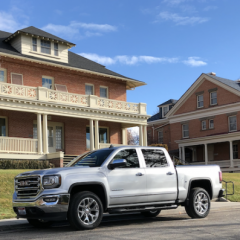 Some owners have reported that the GMC tailgate can strike the trailer ball or the top of the trailer when it is dropped to its lowest position. “The Ram multifunction tailgate is intuitive to operate and owners will find it immediately useful,” said Reid Bigland, Head of Ram Brand – FCA. “Combined with Ram’s class-exclusive RamBox feature and new tailgate step, we’re taking Ram’s cargo management and storage to the next level.” Ram's new multifunction tailgate has four different configurations including: Open flat Open left door only Open right door only Open both doors. Each door swings open 88 degrees and access can be further enhanced via a retractable center-mounted step option. 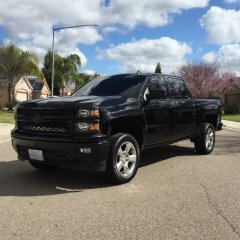 I have a 2008 Silverado 1500 with a original EZ Lift Tailgate that is damaged. I've found a replacement tailgate that is not EZ lift but the hinges are different. GM offers hinges to go from a non EZ lift on the truck side to an EZ lift but not the reverse (at least from what I've found). Does anyone know if I need to change the hinges on the truck bed or is there a kit or bushing I can buy to use the EZ lift hinges that are attached to the truck bed with a non EZ lift tailgate. Thanks! 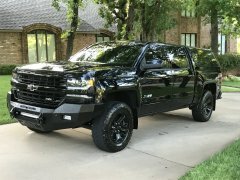 We just bought a new 2018 Silverado Crewcab Short Bed last week. When I first looked at I noticed that the tailgate did not go down level with the main bed (not even close). I brought this up with the salesman and then later with the sales manager. We were assured that they would have this fixed before we picked the truck up. With the tailgate lowered, the left cable was taught and the right cable had slack in it. When my wife picked up the truck, the service department gave her a copy of the service bulletin that said that this was just normal build tolerances and they were not to try to fix it. There are 16 quarters under each end of the straight edge in these pictures (height of 1-1/16"). There is still a gap under the straight edge at the tailgate even when I put my full weight on the rear left corner of the tailgate. The total load capacity for the truck is 1,699 lbs. Allowing for a driver, one could haul 1,500 lbs in the bed. If this was 3/4" plywood, or 2 x lumber 8' long, 750 lbs would be at the front of the bed, and 750 lbs would be on the very rear edge of the tailgate, with more than 375 lbs supported by the left cable. HOW IS THIS NOT A SAFETY ISSUE? In reading the other threads on this issue, it appears that Chevy / GM has had this problem for many years. Hi everyone! Truck owners or prospective owners: How many of you remove your tailgate? And how often? Why do you remove your gate? I noticed GM trucks in 2017 have cables bolted on with a hex head, as opposed to previous years where the cable could be easily removed with a finger. Thoughts? Is anyone experiencing issues with the factory tailgate lock? My key goes into the cylinder fine, turns about half-way and stops. The only thing that I have been able to do is flick (try to lock and unlock) the key in the lock repeatedly until it opens. I don't think there is anything wrong with the cylinder of the lock as at some point it does unlock (after multiple key flicks....20+) BUT now it has me concerned at some point I may not be able to unlock the tailgate. With a locking box cover that can only be opened with the tailgate open essentially locks me out of my box. 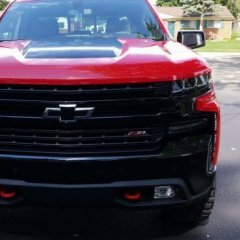 Wondering if anybody has shaved their tailgate to a 2014+ Silverado/Sierra...curious to know how it would look with the camera....I just want to know where rear view cameras are being placed....Im thinking on the very top of the tailgate looking down or right next to the license plate when I do it...any pictures would be great for the people who had done this already...thanks. Hey Forum, Just had linex sprayed in yesterday and needed some help finding screws to replace the factory ones which held in the plastic bed liner. After trying a few sizes, I finally found a perfect fit. My truck is a 2014 silverado with the short bed for reference, not sure if the tailgate setup differs between years or brand. Anyways, these #8 x 3/4" screws fit perfect. Picked them up at my local auto parts store for less than $3. Pictures below! Good afternoon...I am getting a camper shell on my truck for my wife's business, she sells clothes that I need to keep clean and dry. I've done a quick search for tailgate seals and it seems there is anything from weather stripping from your big box stores, so what appear to be custom applications (they might just be lipstick on a pig)... Anyway...I don't mind paying a little extra, but want to find the best one possible for my '16 short bed. Does anyone have any success or horror stories that I should consider or stay away from? Thanks in advance! 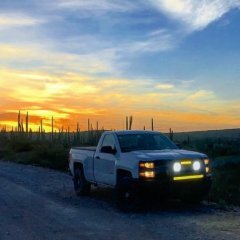 New person here who has some questions for more knowledgeable chevy owners out there. I am attempting to install a regular alarm into my 2000 Silverado, on my alarm it only has (-) power lock and (-) unlock outputs. And I see that the car itself has both positive (+) power lock and unlock. Since I'm not installing a remote start to the vehicle, I didn't purchase any sort of bypass module for the passlock. Do I need it to connect my alarm to my car? Or do I convert the negative outputs to positive using relays? Also since I was adding the aftermarket alarm anyway, I was thinking of running a line to back and attaching it to the trunk pin to act as a sort of door trigger for the tailgate. Can this be done the way I'm thinking of? I want the alarm to go off if someone opens my tailgate. Sorry if I seem to be asking stupid questions. Thank you for your help. I have a 2016 Silverado 1500. I purchased a LED light strip for the tailgate that plugs in using the 4 pin trailer harness and splice in the reverse light. I need HELP trying to get the running light functioning. If anyone knows how to get the running light function to work, please help me out!! !